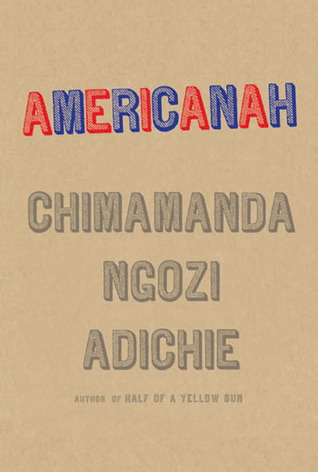 I first read Americanah in 2013 and wrote about it here. This year I suggested it for my library's Community Read and read it again since it had been a couple of years and I wanted a refresher before we come together as a committee to vote. As much as I loved this book I wasn't especially keen to read it again when so many other books I haven't read yet are calling to me, but once I started I became pretty engrossed, even reading over 200 pages on the day I finished it. Last time I focused on how Ifemelu viewed race in America. Her acerbic observations were witty and completely spot-on, and I was struck by how obvious it all seemed though I've never heard anyone come out and say those things before. When she went back to Nigeria after so much time away, she had conflicted feelings about the way of life in her homeland. These pieces of the immigrant experience were what made the strongest impressions on me the first time I read it. Overall Americanah is a love story, and this time I was more focused on the relationship between Ifemelu and Obinze. Their relationship felt real from the very beginning, Ifemelu uncertain about whether he liked her, their small quarrels. When he pressed a copy of Huckleberry Finn on her in an effort to get her to read "proper books," she declared it "unreadable nonsense" and reminded him that she always won at Scrabble. Although they become very close, they allowed themselves to be torn apart. Through a large portion of the book, Ifemelu is in Trenton, NJ having her hair braided, thinking about their past as she prepares to meet him again for the first time in many years. He is married and has a child, so this is not a simple reunion in which they can pick up where they left off. Ifemelu doesn't even know if he will forgive her for how she ended their relationship. It's complicated and messy and I wanted nothing more than for the two of them to find their way back to each other. Some cultural moments stood out to me as well. In America, a white woman came into the hair salon where Ifemelu sat and asked for braids in her hair, like Bo Derek's in the movie 10. As her stylist got to work, she began talking about her upcoming trip to Africa and how she was preparing by reading books. She criticized Things Fall Apart as "quaint" and says "I've just read this great book, A Bend in the River. It made me truly understand how modern Africa works." She rounded it out by saying "It's just so honest, the most honest book I've read about Africa." This from someone who had not yet been there. The scene made me cringe, and was totally believable. This character was not the only American in the novel to completely overcompensate in a misguided effort to express love for Africa. When Ifemelu returned to Nigeria she bonded with others who had also lived abroad, and although they had chosen to return home they shared criticisms of their country. Ifemelu worked in an office with two women, one returned from abroad like her, and one who had never left Nigeria. This poor woman felt totally left out when Ifemelu and Doris started making fun of how Nigerians say "I'm pressed" when they need to go to the bathroom. By this point in the book I felt bad for Ifemelu, because it was clear that neither America nor Nigeria seemed like home to her anymore. When I first wrote about Americanah, I said I thought it would be great for a book group and that still holds true. Obviously I can go on and on about it; I've written two posts so far and there's still more I want to say. Adichie is an incredibly talented storyteller who is observant about the world around her and transports her readers with her vivid descriptions and realistically imperfect characters. If anything I've said about Americanah sounds appealing and you haven't yet read it, I urge you to do so. It's well worth your time.